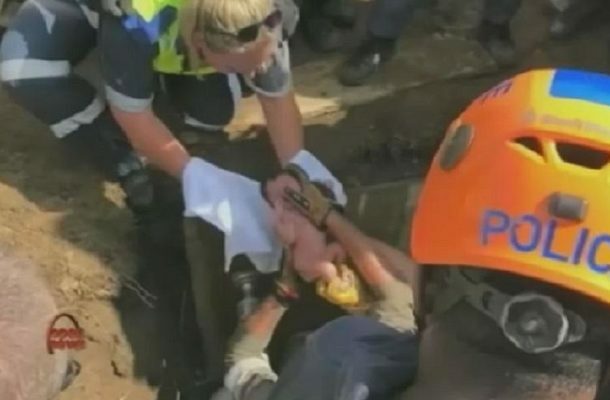 A newborn baby girl was rescued from a storm water drain in Newlands East, outside Durban, South Africa on Monday after being stuck for several hours. The video of the rescue went viral on social media, uploaded by local journalist Bernadette Wilks who captured the moment the child was removed from the drain by emergency services personnel. The baby is reportedly doing fine in an undisclosed medical facility and she escaped with only a mild case of hypothermia. The rescue mission lasted for about six hours. It wasn’t known at this point how the little girl got stuck in the drain, but an attempted murder case has been opened and the parents have not been located.